This past April, attorneys with the Pacific Legal Foundation (PLF) filed suit against the United States Fish & Wildlife Service (FWS) on behalf of a group of property owners in Cedar City, Utah. This suit challenges the listing of the Utah Prairie Dog as a protected species under the Endangered Species Act (ESA). The group, which calls itself People for the Ethical Treatment of Property Owners (PETPO), claims that the listing of the species infringes on its members' constitutional rights and that the FWS violated the Constitution when it decided to help the Utah Prairie Dog recover from brink of extinction in 1973. 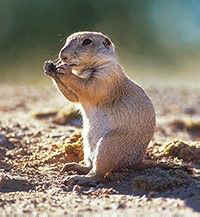 Prairie dogs are some of the most intelligent and social animals on earth. They are also one of a number of animal species subject to brutal and intentional human destruction. One of the most harmed subspecies of prairie dog is the Utah Prairie Dog, and it is once again under attack by anti-animal lawyers and their clients. While being under the gun (or gas canister) is an all-too-familiar place for prairie dogs, this time the Utah Prairie Dog's continued survival as a species is at issue. This past April, attorneys with the Pacific Legal Foundation (PLF) filed suit against the United States Fish & Wildlife Service (FWS) on behalf of a group of property owners in Cedar City, Utah. This suit challenges the listing of the Utah Prairie Dog as a protected species under the Endangered Species Act (ESA). The group, which calls itself People for the Ethical Treatment of Property Owners (PETPO), claims that the listing of the species infringes on its members' constitutional rights and that the FWS violated the Constitution when it decided to help the Utah Prairie Dog recover from brink of extinction in 1973. Before being listed as endangered, only a few thousand Utah Prairie Dogs remained in the wild. The destruction of these animals and their great nation was due in large part to savage poisoning, shooting, and habitat destruction by humans who desire to have the Utah Prairie Dog's land for their own agricultural and grazing activities. Due to protection under the ESA, the number of these amazing animals has increased 10 fold, with an average of close to 34,000 individuals living in the wild today. While much needs to be done to improve the lives of these animals, who are often viciously removed from native homes and "relocated" to prairie dog camps, their fate would be far worse if PLF and its allies in Cedar City were to prevail. Friends of Animals believes that the fate of these animals can't be left in the hands of FWS, who far too often capitulate to the demands of property owners and anti-animal groups like PLF and PETPO. But to come to the aid of the Utah Prairie dog and represent the interest of these animals in the courtroom, Friends of Animals needs your help. While financial contributions will help us pay the cost of defending against PLF, what the Utah Prairie Dogs most need are friends willing to be their surrogate in court. If you enjoy watching these animals, or if you write about them, study them, or photograph them, we urge you to help. Friends of Animals is looking for members willing to state their support for, and interest in, Utah Prairie Dogs in papers to be filed with the court that will decide the PLF case. Volunteers will only need to give a few minutes of their time to talk with Friends of Animals legal team--nothing else! For some amazing pictures of prairie dogs in their natural settings, visit Animals in the Wild.